Fan Mail and 4 Stars! CRADLE OF SECRETS (4 stars), a story shrouded in mystery, darkness and confusion, is quite difficult to resist. Tammie Gardner, whose parents were killed two years ago, has stumbled across information about her now uncertain past. Enroute to a small town in Massachusetts, she is stopped by Dylan Montgomery, who's in town looking for his missing brother. Dylan and Tammie become unlikely partners in Lisa Mondello's captivating, and often quite emotional, story. The second thing authors sweat about is reader fan mail. Since most of the time we live in our own little bubble, not really realizing our books are going out into the world and readers are actually reading the books, it's nice to hear from fans to remind us. This week I discovered that Steeple Hill bookclub fans have already received their shipment of books and I was thrilled to receive some mail from readers who'd sat down and read Cradle of Secrets and enjoyed it. One thing they all asked is, "Is there going to be a sequel?" Rest assured, the answer is YES! In Cradle of Secrets, I introduce some characters that I had no idea readers were going to fall in love with as much as they did. I thought I was the only one! So if you read Cradle of Secrets and you wonder what happens to some of the characters after the book ends, make sure you check back or sign up for my mailing list so I can let you know when the next book is out. You won't want to miss what happens. Thank you so much to all the bookclub readers who took the time to email me and let me know how much they loved Cradle of Secrets. For those of you who have to wait until the book hits the stands, mark your calendars for November 6th, the official release date of Cradle of Secrets. Mix soup together in the bottom of the crockpot dish and place chicken slices on top. Add salt and pepper to taste. Sprinkle cheddar cheese over the chicken and then sprinkle croutons on top. Cover and bake on low for 8 hours or on high for 4 hours. Serve with salad and vegetables. I'm an avid reader, so I thought this week I'd post a review of one of my new favorite books and an interview with its author, Sharon Hinck. Enjoy! The Restorer is Sharon Hinck’s first foray into straight fantasy and it is a wonderful read. First off, you need to know that I am NOT a fantasy reader. I couldn’t read JRR Tolkein’s Lord of the Rings or Hobbit until after I saw The Fellowship of the Ring. I simply couldn’t picture the worlds he created. Finally, my love for my husband and my sincere enjoyment of the movie pushed me to pick up those books. I enjoyed them, but I doubt I will read them again until my kids are old enough to enjoy them. However, The Restorer is a book I know I will return to again. Susan is a mom with a life that seems perfect, but it’s missing something. She longs to do and be more for God, yet doesn’t know how. Her husband creates an escape for her in the attic, a place to hide from the activity of her kids and try to reconnect with God. The first time she uses it, she is sucked through a portal and into a new world. Let me stop right there. I really expected at that point to throw the book aside. I knew it was fantasy, but I had no idea how that would play out. All I knew before picking it up was that a soccer mom takes on a Deborah-esque role. However, I could not put this book down, even as I was sucked with Susan into a world I’d never heard of or seen. Susan experiences all the bewildering emotions of landing in a new place, unsure of what just happened and how she will get home. The first two people she meets in this world scare her to death; she just watched one kill a man, the other seems dangerous in unspoken ways. Yet she is forced to depend on them as she faces the uncertainties and unknowns of this new life. She follows Tristan to his community where he takes her under his wing and begins to teach her the skills of a guardian. In some ways the community seems something out of the Middle Ages, but it’s not. The author paints the scene with vivid details that had me smelling the air, seeing the sky, tasting the strange food. She also painted the characters with strokes that left me feeling like I knew them. It was easy to pretend I was Susan traveling through the story. Feeling the abuse her body took. The overwhelming mental challenges. The spiritual exertion. The story is rich with villains, too. These villains are unlike any I’ve seen before. And their weapon of choice? Poisoning unsuspecting minds with lies that will debilitate. The imagery of spiritual warfare was rich yet shadowed. The book never became preachy, yet I could easily connect with the idea that the truth is all that will protect us from the lies of our Enemy. I LOVED this book, and cannot wait to read book two when it releases this fall. And this from someone who runs the other direction as soon as someone mentions fantasy. Sharon, with The Restorer, you soared past the Becky Miller series (which I thoroughly enjoyed!) into the realm of full-fledged fantasy. How did you create the concept for this book? I think women are more heroic than they realize. I’ve always been inspired by the story of Deborah from the book of Judges – and I see modern people around me every day who remind me of her. I wrote this story for my friends – ordinary women who are sometimes called on to fill extraordinary roles that they don’t feel prepared for. We may not be literally yanked into an alternate universe, but the idea of being pulled into an unexpected challenge is very real to most of the people I know. I wrote this book for my friends who receive a diagnosis of cancer, or the news that their child has a learning disability, or their parent is battling Alzheimers, or their spouse has lost his job. They suddenly find themselves in a foreign world, facing new rules, and being asked to fill a role they don’t feel ready for. My prayer is that as well as being entertaining, this novel can inspire courage and determination for those facing daily battles. Susan has hints of Becky Miller. She's feeling some dissatisfaction with the life she has even though there's nothing wrong with it. Then she gets sucked into another world. How did you envision the setting? It is rich andeven a non-fantasy reader like me could see everything! Hee hee! Honestly, it was one of those over-long Minnesota winters. They are great for inducing melancholy periods of creativity. It was an unusually warm winter where the sky was gray for weeks at a time. I began to doubt there was a sun or moon or stars beyond the shroud….which led to wondering about a world that was literally shrouded all the time. The setting around Braide Wood was inspired by hiking in the North woods. Other communities were developed from extrapolating the natural resources nearby and how they might build homes, roads, etc. I also wanted to do something new. I didn’t want to revisit Middle Earth or Narnia (which was done by better authors than I) so I played, “what if?” What if this world had certain technologies that had developed in different directions and with different priorities than our world? How would that look? I sense you have a heart for women who want to do and be more for God. What do you hope women will take from this book? Susan’s spiritual journey – her desire to follow God and her confusion when the road is much harder than she expected—is very parallel to my own. I’ve never carried a sword into battle, but I’ve faced the challenge of surrendering more deeply to God’ s purposes when they didn’t make sense to me. It’s my hope that Christians who are feeling discouraged or weary or confused by life’s battles will take away a little encouragement from watching Susan’s story unfold. And I pray they will be strengthened in the knowledge that they CAN be a blessing to the people around them as God empowers and guides. Now, this book isn't just for women. True. I have received LOTS of reader mail from men and from teens who loved the book. Trying not to give too much away, but how did you develop Tristan and Marc? Both were so real (loved the twist with Marc by the way) and so heroic. Was that easy to capture? Thank you! No, it wasn’t easy for me. I find noble characters difficult to write. They can come across flat and boring. It’s much easier to write “bad guys” sometimes. I wanted my heroic characters to be MORE interesting than the villains, and so I challenged myself to rework those scenes many times. I'm not a fantasy reader -- couldn't read Tolkien's Lord of the Rings series until after the first Peter Jackson movie because I had no framework for it -- but I LOVED The Restorer and can't wait for book two. Did you intentionally try to bridge the gap between fantasy readers and fantasy avoiders? What tricks of the trade did you use to accomplish that? Yes, it was VERY intentional. Many of my friends haven’t read much fantasy and I’ve always loved the genre (L’Engle, Lawhead, Lewis, etc.). I wondered if I could introduce a very relatable character that would make the story accessible for even my friends who don’t normally read fantasy, and allow them to enjoy the imaginative adventures that I’ve always found in the genre. I purposely used a more contemporary fiction voice than many “high fantasy” novels and experimented with blending a little humor, a woman’s fiction sensibility, along with the “out of this world” and adventure elements. You and three other fantasy writers just returned from a whirlwind book tour. How did it go? What did you take away from that face time with readers? The Fantasy Fiction Tour was an amazing, non-stop experience. We hit something like 16 cities in 8 days, and over 25 events and met hundreds of readers in a variety of venues. I was blessed out of my socks by hearing from readers who said these books were not only entertaining, but inspiring and life-changing. It affirmed to me the power of story as a way to communicate and encourage, and showed me the hunger that people have for books that are imaginative and soul-stretching. The Restorer’s Son is already available to preorder at my website and features a new and very unlikely Restorer, as well as more adventure for Susan and her family. The Restorer’s Journey releases in January 2008. Then I have two contemporary fiction novels coming out with Bethany House (Symphony of Secrets, 2/08 and Penny’s Project, 9/08). I love to hear from readers, so be sure to visit my website. You can also sign up for my Book Buddy ezine to keep in touch. Thanks so much for your time and for the vision you pour into your books. Whether Becky Miller or Susan, I am challenged and entertained when I read your work. Someday I'll write like you! LOL! No, you’ll write like Cara, and that will bless many. Moonlight and Magnolias Is Next! I'm home from the American Christian Fiction Writers Conference, and it was wonderful! The board did an outstanding job coordinating the four day event, and our own Craftie Lady Cara Putman worked hard to ensure everyone had a great conference experience. Thanks, Cara, for all you do for ACFW!!! So many of my fellow Steeple Hill authors were there, and Senior Editor Krista Stroever received the first Editor of the Year Award. Krista's fantastic and the award couldn't go to a better or more deserving person. Many of the Steeple Hill authors were finalists, and Book of the Year Awards went to Margaret Daley, Linda Goodnight and Colleen Coble. Congrats to all! As I mentioned last week, seeing my Seeker friends was the highlight of the weekend. They're the most wonderful group of women. Eight of us attended the conference, and I spent lots of time visiting with Janet Dean, Camy Tang, Myra Johnson, Mary Conneally, Julie Lessman, Cheryl Wyatt (another ACFW Board member)and Carolyn Slaughter. Ladies, you made ACFW 07 even more special! This Thursday, I'll head to the Georgia Romance Writers Moonlight and Magnolias Conference, which will be another opportunity to learn more about writing and the publishing industry. My agent Deidre Knight, Jennifer StGiles and I are giving a workshop entitled DRESS FOR SUCCESS: Finding the Perfect Agent Fit for Your Career. I hope those who attend will learn lots of good information to help them select an agent that's right for them. Mix pudding mix and pineapple. Gently stir in Cool Whip. Cut cake in 3 layers, and spread Cool Whip mix between each layer. Top with the mixture and refrigerate for at least an hour. Makes 10 servings, 120 calories each! We're in the last week of Septmeber, fall has officially begun. Every where I go I see pumpkins and harvest decorations. Invitations are starting to filter in for holiday parties. Mostly potlucks. One of my favorite dishes to take are Hot and Smokey Baked Beans. These are a hit and are great if there are leftovers. Preheat oven to 350. Cook bacon in large skillet over meduim heat until crisp. Transfer to paper towels. Transfer 2 1/2 tb bacon drippings from skillet to large bowl. Finely chop bacon add to bowl. Add onion and next 7 ingredients to bowl and whisk to blend. Whisk in chipotle chilies and then stir in beans. Transfer mixture to 13x9x2 glass baking dish. Bake uncovered until liquid bubbles and thickens slightly, about 1 hour. Cool 10 minutes. Sprinkle with parsely and serve. Can be serve at room temperature. Yesterday I sat in a chair at a neighborhood nail place and pampered myself. Before marriage and baby, I did this a lot. Since marriage and baby, I do this sparingly - think maybe twice in five years . Anyhoo, let's begin at the beginning. Yesterday afternoon, Mikey went down for a nap. I cleaned the living room, did laundry, unloaded the dish washer, read a contest entry, and then... most amazing... Mikey still slept. So, Cheshire smile on face, I slink toward 'da' husband and say, "You know, I've been wanting a pedicure. Mikey's still asleep. I'm going to go get one." He's also in bed taking a nap. I'm sure that's why he didn't tabulate how long Mikey'd been asleep, and off I went. Being it was Sunday, the first place I tried was closed. Yes, I think all nail places, and many other places, should be closed on Sunday. The second place I tried was open. I walk in, they take walk ins, and promptly sit in a chair and the nail tech begins. First of, there is no first time pamphlet. The chair had a control on it, so I'm thinking it's a massage chair, but I don't want to play with the control. There are about ten chairs, all in a row, and more than half are occupied. Unfortunately, this is not the beauty parlor of the fifties (If I ever find one, I'll go every other week!) and none of the ladies are talking or laughing. The nail techs are talking and laughing but not in a language I speak. I pull a book from my purse and start reading. The nail tech asks me if I'm a teacher. I check my shirt. Am I wearing a name tag? I ask her how she knows and she motions at the book. I'm concerned because I want the plumbers, secretaries, lawyers, and car mechanics of the world to pull books out when their getting their nails done too! I'm sure the nail tech thought I had indigestion as these thoughts flittered across my face. A moment later, she got a little carried away with a sharp instrument and I yelp. Everyone looks at me and/or her. I'm embarrassed because I yelped loudly, and then I worry about 'saving face' a concept I only know from television. I assure her everything is fine and check for blood. It's there but minutely. She finishes my feet and then because my cellphone hasn't sounded (I'd forgotten that I turned it off before church and hadn't turned it on after church) I go ahead and get the fingernails done. This includes a hand massage that I don't want (I am probably one of the few humans who truly hate massages). When she finishes, I'm wildly happy. My feet are soft and feminine looking. My nails are even, painted, and two of them have little jeweled flowers painted on. I pay a ridiculous price and scoot out the door to drive home wearing those flimsy little slippers they provide. Roll out pizza crust into a rectangle. Poor barbecue down the middle. Fold pizza crust until barbecue is covered over. It should look like a loaf. Cook on 425 for 35 minutes. Today I head to Dallas for the American Christian Fiction Writers’ National Conference. I am so excited about many aspects of this conference. First, it’s the only conference that focuses exclusively on fiction. Since that's what I write, it's a good place to be. Second, at it’s opening session last year, I received my very first book contract. I will never forget that experience. And can't wait to watch someone else get that blessing this year. Third, God has used the people in ACFW to train me to be a writer. I’d read a ton before joining. I’d even read craft books on how to write. But it was in ACFW that I learned what terms of art like POV (point of view) meant. I still remember going to my first state meeting and wondering at the strange terms I kept hearing. It was like another language. Fourth, I’m excited to get to serve. This will be my first conference as a national board member. Plus, I will serve as a workshop hostess again and work a shift in the bookstore. Fifth, I actually get to teach a bit at this conference. I love to teach, so am THRILLED to get to share some of what I’ve learned. One of the times is on a panel with several of my writing buds, so it should be fun. So if you don't hear a lot from me this week...you know why. And if you're interested in following what's happening at the conference, check out the ACFW Conference blog. My editor emailed me yesterday, saying Steeple Hill had approved the title of my new series -- MAGNOLIA MEDICAL. Since I've worked in the clinical lab setting as a medical technologist and wrote articles on emerging infectious diseases for medical publications, the stories will involve laboratory personnel -- mainly medical technologists -- who become involved in crimes that have a infectious disease connection. Of course, the magnolia part of the title gives the location away. The stories will be set in the south, primarily Georgia, which is my home state. So if you like suspense and a good love story, plus you enjoy medical thrillers, be sure to watch for COUNTDOWN TO DEATH, which will launch the series in October 2008. Tomorrow I'm heading to Dallas for the American Christian Fiction Writers conference. It's always wonderful to gather with other writers and to reconnect with a special group of women -- The Seekers. We started as an online group in 2005 to share information on writing and for support. Since then, we've become good friends. We'll be spending lots of time together as we catch up on every one's latest news. Seeing dear friends, attending workshops, meeting new writers and revisiting with those we cherish are just some of the reasons ACFW has such a good conference. The other part is the peaceful spirit that flows throughout the long weekend. I always come away uplifted and rejuvenated. The following week will be Georgia Romance Writers' Moonlight and Magnolias Conference in Atlanta. If you're in the area, be sure to stop by the Book Fair and Autographing on Saturday. Linda Howard will be giving a talk as well as CIA Assassin Rolan Haas. Booksellers and librarians will breakfast with the authors on Sunday. For more information go to www.georgiaromancewriters.org. I'll be back to blog next Wednesday. Be sure to leave a comment and let me know what you're reading and writing. Slice summer squash and lay in greased casserole. Spray with butter. Salt and pepper. Sprinkle with Italian Seasoning. Top with grated Parmesan cheese. Bake in 375 degree oven for 45 min to an hour. Enjoy! During the summer the media talks about 'the beach' read. But what about 'the cold, rainy' day read? Oh, those lovely fall rainy days when the sky is gray and the air is brisk. Now those are the kind of days I like to curl up on the couch, a throw over my legs and a book in my hands. And I love to have a warm bowl of soup to nourish my body as well as my soul. My all time favorite comfort soup is Tomato Basil. Because I'm not much of a cook, I usually open a can, but only Amy's Organic Tomato Basil. But if I'm in an ambitious mood I do have the most delicious receipe! This past weekend I spent in Tucson, Arizona, at the Society of Southwestern Authors' conference. I've gone many times. The first time I went, about a decade ago, Ray Bradbury was the speaker. Wow. I remember thinking back then, "How do they top this?" Three years ago they had a speaker whose claim to fame was her years as one of Phyllis Diller's joke writers. Wow. What did I learn at this most recent conference? In the historical market, according to Tracy Bernstein, American settings are dead. Not even in the top four. Apparently the readers want Britain, the time of the Tudors. If you don't want to write about the Tudors, then France is the next best thing, following by Spain and, of all places, Japan. Hmmmm. I attended an Inspirational Writer's Session, geared to the beginner, and was reminded of the importance of everyday humor. The Romance session, taught by Andree Abecassis was informative. The main thing I took from this was that a writer who wants to build a readership should probably be putting out three books a year - at least two, but definitely three is the goal. The other workshop I attended was the Mystery workshop. Made me think about making sure I have the who, what, why, when, and where in the first few sentences. Betty Webb, who taught the class, did a good job of showing how most 'great' writers do this. One can of Cream of Chicken soup. Turkey (Usually, I use leftovers - like from Thanksgiving - but in a pinch, I buy the little square bag that has precut turkey inside. I first found this precut turkey when I was making chef salads at home. In the grocery store, it's usually by the precut ham. And, oh yes, it costs wwwaaaayyy too much which is why leftovers are better). When it looks like a pie, put the other shell over the top, stick in the over for 45 minutes, and then enjoy. I'm thinking about adding a few hashbrowns next time, but so far husband is against that idea . Love Christian Fiction? Live near Dallas? Usually on Saturdays, I'll post reviews of different books that I've read and enjoyed. Expect lots of suspense, but other books as well. This week though, I wanted to let you know about an exciting opportunity for book lovers in the Dallas/Fort Worth area. Do you love Christian fiction? Then come to the ACFW booksigning on September 22nd from 1:30-2:30 at the Dallas Addison Quorum Marriott, 14901 Dallas Parkway, Dallas. Click on the picture below to see the flier. Hope you can join us! I'm still sprinting while I finish up the sequel to my November 2007 release, Cradle of Secrets. To help out, my kids have taken on a lot more work in the house to give me extra time at the computer. Like many parents, I spend a good deal of time carting my teenagers around to various activities like my 16 year old's first job, my daughters daily cheerleading practices, and school dances. Yes, they still have them and around here since there isn't a mall in site for the kids to hang out at. They have them almost weekly at a local church. All this carting around takes away from computer time, so my kids have been helping out with things like the laundry. Now, I taught them how to do laundry years ago but the concept of separating whites from darks seems to have been forgotten somewhere along the line. I'm usually interupted in the middle of a scene by a shriek from one of the girls because a new white shirt is now powder blue (blotchy at that) because a new pair of jeans was added to the washing machine at the last minute. Yes, one red sock really can turn my 16 year old boys shirts pink, transforming them into dusting rags because he wouldn't be caught dead ina pink shirt. Folding? Well, we haven't gotten to the point where we've mastered that. I'm lucky if we can at least get all the clothes sorted into piles by child before one of them reaches to the bottom of the laundry baskets (Yes, I have several. I did mention I have 4 teenagers, didn't I?) and spills everything that's on top onto the floor. I'm lucky that my kids are cool about me working on my book and are willing to help out. Even so, I'm thinking October 1st I'll be starting marathon cleaning. Don't forget to sign up for my contest! From now until November 1st, 2007, everyone who signs up for my mailing list will be entered into a drawing to receive not only "a" book from my backlist of Avalon titles, you will receive the entire Texas Hearts series! These books are beautiful hardcover traditional love stories. To sign up for the contest, simply send an email to Lisa@lisamondello.com. Make sure you put Contest in the subject line so I know you want to enter. Until next time, enjoy my new recipe and many blessings to you! This is a favorite recipe for my family and very quick and easy to make! Lightly butter the bottom and sides of your crockpot dish. Add all the ingredients from the box of scalloped potatoes and the ingredients to make them inside the dish. Drain can of vegetables and mix that into the scalloped potatoes mixture. Sprinkle salt and pepper on each breast of chicken and place them on top of the scalloped potato and vegetable mixture. Add a slice of cheddar cheese on top of each chicken breast. (You can also use shredded cheese if you prefer.) Crush the croutons to a fine consistency and sprinkle over each chicken breast. Cover and cook on low for 7-8 hours or high from 4-5 hours. Barbour was an absolute dream to work with on getting this cover. They sent me one option. I made a suggestion. They sent me THREE revised cover options. I made another suggestion. And now I have a cover that I absolutely love! Final galleys are in and to the printer. Last step: finished book. I can't wait to hold the first copy in my hands! Here's the blurb on the book: In the aftermath of Pearl Harbor, Audrey Stone wants to help in the war effort. But what's a young schoolteacher from Nebraska to do? When her community starts a canteen at the train station, Audrey finds her place. Willard Johnson worries about his brother who joined the navy to get off the ranch and see the world. Will his budding relationship with Audrey survive in the pressures of war? Can two such determined people find their place in the war and with each other? Maybe I should have retitled this posting, especially since we're talking about recipes! No, COUNTDOWN TO DEATH has nothing to do with my cooking! I received a two-book contract from Steeple Hill on Friday for a medical lab series, something I've been wanting to write for a long, long time. COUNTDOWN will be the first title in the series and is scheduled to be in bookstores October 2008. Of course, I was thrilled. In fact, if you live in the Southeast, you probably heard me shout for joy! I spent the weekend and all day Monday working on the Art Fact Sheet. That's the information the author provides the art and marketing departments on the book. It's an involved four-page document that requires a 300-word sysnopsis, scene descriptions and character sketches as well as other tidbits of information about the story. That's done and I'm ready to start writing. Of course, I wanted to let you know my good news first! Hope your writing is going well. Lenora Worth and I are currently teaching an online course on writing for the inspirational market. Lenora is such a great novelist, and it's been a joy working with her. The class was offered by the Birmingham, AL, Southern Magic RWA chapter--a fantastic group of writers who make everyone feel welcome and right at home. Today's recipe is complements of a dear friend of mine, Marilyn Hammond. She'll have a birthday soon . . . I'm not telling her age . . . and if you know Marilyn, give her a birthday hug for me! Heat chocolate in double boiler until melted. Fold in Kool Whip and stir until all the chocolate is mixed in. (Don't keep it over the heat too long.) Pour into a baked pie crust and chill. It's yummy and sure to please any chocolate lover! DeMarle at Home baking success! This past spring I discovered DeMarle products. I've never been much of a baker or a cook, for that matter. So when I was invited to a product party at a friends house I was a bit skeptical. But I watched in amazement as the presenter cooked on the silpat and in the formed baking products. Nothing stuck, not even cheese. This product makes baking and cooking so easy and efficent. Needless to say I'm hooked! One of the very cool ideas that the presenter showed was taking shredded parmesan cheese, spread it out in small groups on the silpat and bake. As soon as the cheese is crispy looking, take out and then, using a spatula (they have a great, one by the way) lift the flat cheese off the silpat and drape over the bottom of a small bowl. As the cheese cools, it forms a bowl that can be filled with salad or steamed veggies. It's a beautiful way to serve a side dish to guest. I grew up in Nebraska. It's winter nine months of the year. I can remember chill winds that encountered my puffy coat, bounced back, and then headed for the hem and under to make sure I got chilled. Never, not once, did my family and I go camping. I first went camping during my thirties with my friend (and fellow writer) Cathy McDavid. See, now I live in the dry heat of Arizona and don't even own a puffy coat. Very few chill winds. Camping is a worthwhile past-time. The first time I went camping, with Cathy, I slept in a travel trailer. The second time I slept in a horse trailer. Sad to say, I only went twice. Then, I married an outdoorsman. Yup, my hero. The first time we went camping we slept in a tent the size of two bodies - small bodies. We were newlyweds, but still I suggested a bigger tent. The next time we went camping, we had a tent with two rooms. Much better. Then, I got pregnant. Getting up off the ground, while pregnant (and old!) is not much fun. I did a lot of muttering. A few times later, we had a Jumping Jack. This actually made me like camping. It had two beds - with cushions - that were off the ground. There was a table. This tent popped up and was on wheels. Our quads fit on top. Then, when Mikey was two came the rainy camping trip. Eight hours in the Jumping Jack. It's roughly the size of a large bathroom. The space not taken up by the beds and tables in one sidewalk square. The thing about rain is.... Mikey was stuck in that space for hours, and he did get bored. This meant I didn't get to read, write, watch any DVD save Thomas the Train, or well have peace of mind. Oh, and should nature call, well nature was very, very wet. This past weekend we went camping, in a new travel trailer. It has pop out beds, a table, a fridge, a stove, a micro-wave and a TOILET. No matter how many obstacles wind up in your way, if you keep doing it, you'll get better and it will get easier. Every once in a while I get a book in my hands that I can't put down. I love that. Especially if the book keeps me up until the wee hours of the morning (2:30 AM to be exact), making me sleep deprived. There were a lot of things on my to do list yesteday that didn't get done because I sat down and started reading The Marriage Bed by Judith Arnold. From the opening page, I was sucked in and couldn't stop reading. The Marriage Bed was published by Harlequin Everlasting this past May but I just received a copy. I'm so glad I did. I've been a Judith Arnold fan since I read Barefoot in Grass years ago, but it's been a while since I've read one of her books and The Marriage Bed reminded me why I need seek Judith Arnold books out more often. In The Marriage Bed, Joelle and Bobby D had been best friends their whole lives, got married, built a life together and raised a family. But when Joelle's Ivy League ex-boyfriend from high school comes back into their lives begging for help, the family they've raised and the love they've shared for 37 years begins to shatter. Judith Arnold creates sympathetic characters with a conflict that is compelling. The love story is beautiful, realistic and made me sad the story was over when I reached the end. If you can find a copy of The Marriage Bed, I highly recommend you read it. In a skillet, saute bacon, onions and potatoes. Drain the pan drippings and put mixture into the crockpot with the other ingredients. Stir well. Cover and cook on low for 6-7 hours. Chowder is great with a salad and French bread. Enjoy! I have to tell you, I have been THRILLED about the process of working with Heartsong Presents on the cover for Canteen Dreams. Often as a writer, you will hear horror stories of authors who hated their covers, but there was nothing they could do about it. One agent told me that was a place this particular person could be helpful. And I'm sure this agent was right. It can help to have someone run interference. But Heartsong has been wonderful! My editor JoAnne sent me the first cover several weeks ago. I liked the picture and LOVED the backcover copy. But the image was missing something. It had a rancher looking guy and a train. The kind of image that could be from anytime after oh about 1870. My books set during the opening days of World War Two. Pearl Harbor is the inciting incident in some ways. I didn't want someone to pick up the book based on the cover and think they were getting a typical western. That's so NOT what I write. But the moment you read the backcover copy, you knew exactly what kind of story it was. So I emailed my editor with everything that I loved, and an idea about how to match the cover with the time period. I'm not overly creative when it comes to visual things, so wouldn't have been surprised with whatever they came back with. My editor very graciously agreed that it needed something to hint at the time period. Yesterday morning I got THREE options. Not one, not two, but three! I am thrilled. There are elements I love about all of them. They really capture the time period and let you know from the first glance when this book took place. And I am humbled all over again about how God took this little dream of mine and placed me in the perfect place, working with the right people. He is so amazingly good to me. 1. A Big Apple Christmas by Vasthi Reyes Acosta, Gail Sattler, Lynette Sowell, and Carrie Turnasky from Barbour. A contemporary collection of four novellas that captures the sights and sounds of Christmas in New York City. 2. A Mommy In Mind, A Tiny Blessings Tale, Book 3 of 6 by Arlene James, from Steeple Hill Love Inspired. A single woman trying to adopt an infant eventually realizes that the attorney behind a nightmarish custody suit is God's chosen mate for her. 3. A Shadow of Treason, 2nd book in The Chronicles of the Spanish Civil War series by Tricia Goyer from Moody Publishers. Sophie must leave behind the man she loves and return to the person who betrayed her. Another layer of war in Spain is revealed and nothing is as it seems. 4. A Texas Legacy Christmas, Texas Legacy series Book 4 by DiAnn Mills from Barbour Publishing. Snuggle down between the covers of A Texas Christmas Legacy, where the miracle of love and life awaits you on every page. 5. Boo Humbug, The Boo Series by Rene Gutteridge from WaterBrook Press. The zany characters of Skary return in this Christmas novella. 7. Long Trail to Love 2nd in the Vermont Contemporary series by Pamela Griffin from Heartsong Presents. Carly loses her boyfriend, her job, and the town’s respect in one crazy moment while out-of-towner Nate suffers a similar fate, but when they become “team mates” during a hike into Canada, the trek doesn’t allow for a smooth climb – in more ways than one! 8. Mason's Link by Bill Andrews from Xulon Press, recounts he fictional discovery of a link used to communicate with a departed loved one, considered by Heavenly powers to be the most important event since the Resurrection. 9. Montana Mistletoe by Lena Nelson Dooley, Lisa Harris, Debby Mayne, and Kim Vogel Sawyer from Barbour Publishing. Four friends make a pact to marry by their twenty-eighth Christmas, but as the deadline looms, careers and experiences threaten to douse their Christmas spirit — and their chances for romance. an old friend to help, but will she find love or will the danger get her first? 11. Sushi For One? by Camy Tang from Zondervan. Will Lex Sakai be able to surrender her "perfect man" list and give Mr. All Wrong a chance? 12. The Restorer’s Son by Sharon Hinck from NavPress. A new, reluctant Restorer is asked to sacrifice for his people—if he can find a way to yield to the One. 13. When the Morning Comes by Cindy Woodsmall from WaterBrook Press. Wounded by her family, doubted by her fiance, Hannah Lapp plunges into life outside her Old Order Amish community. 14. When the Nile Runs Red by DiAnn Mills from Moody. An Arab Christian dedicated to helping the Southern Sudanese is hunted by his Muslim brothers. I hope everyone had a great Labor Day weekend. I spent Saturday and Sunday at the Decatur Book Festival, a two-day event that brings writers and readers together. This was only the second year for the festival held in the heart of Decatur, GA, a beautiful town that sits on the eastern edge of Atlanta. Last year, I helped man a booth for my local Sisters in Crime chapter. With over 50,000 folks attending, I decided my Georgia Romance Chapter needed to be involved this year. The weather was hot but beautiful, and we passed out lots of promo material from all our great authors, plus information on our upcoming Moonlight and Magnolias Conference. By the way, registration will remain open until September 15th. 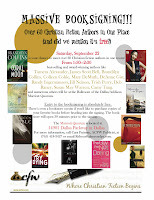 Currently, eleven editors and agents will be attending. In addition, we'll have a book fair and autographing, featuring all our authors as well as our keynote speaker, Linda Howard. But back to the Decatur Book Festival. More than 15 venues around the small-town square hosted talks by well-known authors. Diana Gabaldon stopped by our booth to say hello. I introduced myself, then noted she had an author pin on. "You're a writer," I gushed, never having seen her picture. Diana was a doll and laughed when I said I was sorry I didn't recognize her. Suzanne Brockmann was there as well. GRW President Anna DeStefano and I stopped by her authographing to offer her a warm Georgia welcome. Of course, many of our own GRW gals spoke, including Anna, Karen White, Wendy Wax, Carmen Green, and Patti Callahan Henry. There were activities for the little ones, lots of good food, music and entertainment and thousands of people talking about books. What could be better? I'll be there again next year. If you're in the area, be sure to stop by! I'll be giving away another chance to win a copy SCARED TO DEATH to anyone who stops by the blog to say hello. Flo won a copy last week! Congratulations, Flo. A few years back I belonged to a gourmet dinner club with seventeen other ladies from my church. It was a blast. The food was great but the fellowship was what made the three years that we had together the best. The dinner club has long since gone the way of the wind but I still have my recipe book. Let sit for several hours before serving over Salmon, Halibut, Chicken, Sword Fish or Tuna Steak. I'm reading the third book in the Potluck series. At the beginning of each chapter is a recipe. I look at them and think, "I can do that." Think and do are two different activities. I was single for a long, looooonnnnnggggg time. I've been going to church potlucks for that long. Here's the recipe that helped me feel like I contributed at potlucks. Buy a box of graham crackers. Buy a can of chocolate frosting. Break graham crackers into fourths (good news: graham crackers are perforated). Spread frosting on a fourth. Put another forth on top. You've just made an interesting cookie. Make cookies until frosting can is empty (No, you should not make one cookie, eat one cookie). Put them in the refrigerator. Take to potluck. Kids will love you. Married women will talk about you. Single men won't notice you. And, yes, the first time I served my soon-to-be husband meatloaf, someone else had prepared it for me (The preschool teacher actually turned pale when I mentioned I was cooking for my new boyfriend. After school, she showed up with a whole meal complete with microwave instructions. Thanks Wanda!). When he said, "You're a good cook." I nodded. I am a good cook. I make great sloppy joes! I got to thinking the other day that we all have our favorite recipes that get us through the busy week whether we are on a deadline for our next book, or carting the kids around. What a great thing it would be to share them all! My favorite thing is the crockpot during the fall and winter months so I'll be showcasing recipes for the crockpot. My other Ladies of Suspense bloggers will also showcase their favorite recipes to share with you. Come back often, print out your favorites and try them. I'd love to know what you think so make sure you come back and let us know. Pamela Tracy will be kicking off the week with her favorite recipe and you'll get another recipe each day after. Enjoy and make sure you come back and let us know if you tried a recipe you like and even share your favorite recipe, along with your favorite romance book.